Ok, I really gave been lazy with the blog now for a few days, but I've been hanging out with Jonatan here in San Diego and it has actually been really awesome. I knew he would have loads of study to do, and lots of flights to take but that just gave me an opportunity to catch up on my train regimen (read: trim of all the f***ing fat and get in shape again). It really is quite hard to motivate yourself to go out training when it is cold (since I've been in the southern hemisphere), you're sick (because I barely eat and when I do, it's rarely healthy) and you are in some of the worlds most spectacular places. So just going out for a 2 mile jog everyday with a couple of dozen pushups is a good start for me again. Regardless, it has been great seeing Jens again. Haven't really seen a familiar face in almost three months and him I haven't met in over a year. Plus I got to sit in on a few of their lessons and actually see how they study... Even less discipline than we had in high school. And these guys are going to be our dividing line between a quick flight and a fiery death from the skies above. 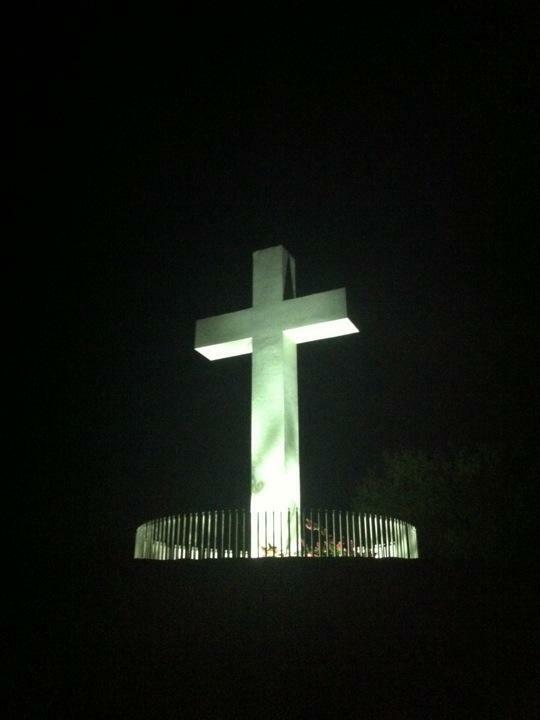 Battery is running short now, so have to end, but the picture is btw of a cross on top of a mountain that you (supposedly) can't get to after dark... Mwahahah!